The Ka’iwa Ridge Trail, otherwise known as the Pillbox Trail, is located on the ridge overlooking Lanikai and Enchanted Lakes, both suburbs of Kailua on the windward side of Oahu. Lanikai was once an agricultural area with fields of watermelon, but later the area became secluded weekend vacation homesteads for the wealthy to escape from Honolulu. The beauty of Lanikai beach and Lanikai Bay with it’s close proximity to the offshore islands (the Mokes) has turned Lanikai into a place of great renown over time. This trail has become one of the most popular trails on the island because of the stunning views of Kailua Bay, Ko’olau Mountains, ease of accessibility, and length of hike. A recent survey showed 1,370 visitors in one day! The “pillbox trail” should only be accessed by either of two public easements over private property. There is one originating in Enchanted Lakes at Kamahele Street, which is lesser known and one originating on the Lanikai side of the Bluestone property. 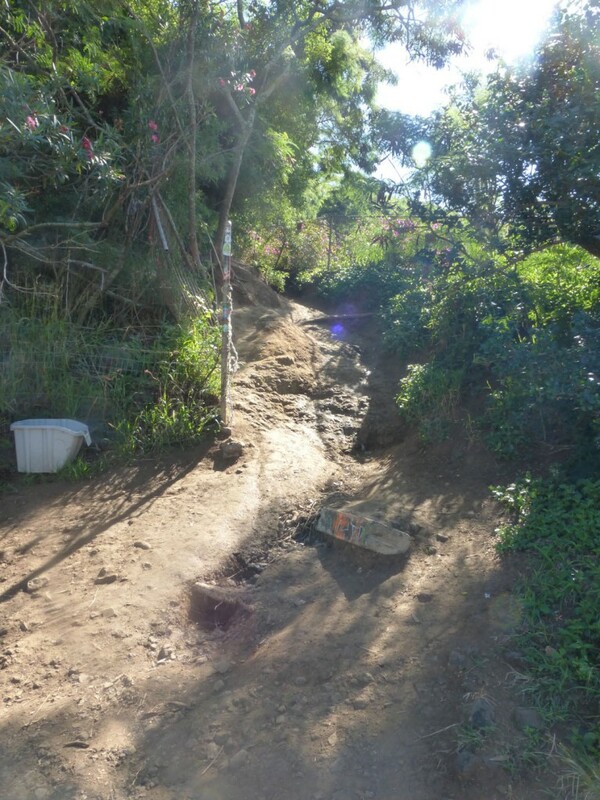 The entrance to the Lanikai side of the trail is very worn, and ropes are needed to get up the first part because of severe erosion due to the onslaught of hikers in recent years. The two public accesses to the pillboxes are on public easements over private properties and are not managed for public recreational use. If you branch off from the main trail you will probably end up on private property. Other accesses are subject to landowner approval, and if used without authorization, you will be trespassing and possibly putting yourself at risk. 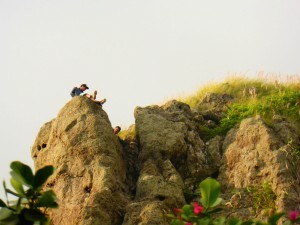 Although it may look like fun, the boulders are not always stable and may give way at any time. It may be a good photo op but why take chances? Be careful and stay on the trail! There are lots of bicycle shops in Kailua where you can rent a bike if you take the bus to Kailua.